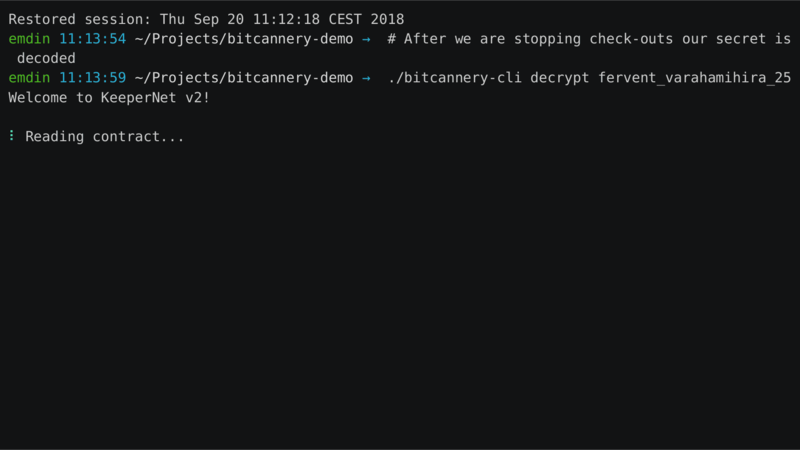 You can download bitcannery-cli binary from the recent release or click here to download the newest version. App will ask you to import or generate new BIP39 seed phrase for your Ethereum address. If you don't have enough ether on the address, you'll get a warning. Currently BitCannery works in Rinkeby network, so you can easily get ether with Rinkeby faucet web service. Account balance is too low, please add some ether to it. App will ask you to choose name for the message delivery contract, password for your local message storage and check-in period duration. In app response you'll get contract address, which we recommend to back up in case you lose app config. App will output Waiting for keepers..., and after some time it will ask to choose Keepers amount. Next app will deploy your new contract in Ethereum blockchain and print you private key. Pass it with your chosen contract name to person you want to receive the message. Important If your addressee will loose the key, there is no way to recover it and secret will be lost! App will ask you for a contract name and to confirm. If there's not enough active Keepers to keep the message safe, it'll offer you to do Keeper rotation. <name-of-your-contract> is the name you've chosen on contract activation. App will ask you for password and your confirmation. Later it will deploy new smart contract and start gathering new Keepers' proposals. After you assign new amount of Keepers, new smart contract will be activated and an old one will be cancelled. <name-of-your-contract> is the name you've chosen on contract activation. App will ask you for confirmation, and after this contract would close for any further actions. <name-of-your-contract> is the name of contract you've received with the private key. App will ask you for this key, and either decrypt the message or ask to wait for more keepers to send their message parts. In latter case try decrypting the message in a couple of hours. To run your own Keeper node, you need to specify your keeping fee first. <X_Gwei> here is a daily fee in ether you want to receive for keeping. If integer is passed, it's treated as wei amount; you could pass in strings like 1000 wei, 10 Gwei or 1 ether. If you hadn't set up Ethereum address, app would ask you to either import or generate new BIP39 seed phrase. Then Ethereum address will be set up, you'd need to have ether for sending proposals to keeping contracts. Currently BitCannery works in Rinkeby test network, and you could get ether in this network by using Rinkeby faucet web service. If address has enough ether to pay gas price, you would have fully automated Keeper node. It will send proposals to new keeping contracts, receive message parts, check contracts, receive keeping fee and reveal message parts in case of missed checkins.